Baltimore. A city built by those who take what they’ve got and make something more. A football team that started from nothing and worked its way to perfection—twice. This season, 160over90 launched the Ravens new brand, steeped in the modern-gothic spirit of Poe’s hometown. Coming off of three tough seasons, the team looked to energize their long-time fans and capture new ones. And after a fired-up training camp sparked by coach John Harbaugh and an influx of new players at key positions, the Ravens were ready for more. We looked to the franchise’s namesake poem to craft a rallying cry that would unite a city and capture the unrivaled attitude that sets Baltimore apart. Then we dialed up the intimidation factor, crafting a look and brand voice that brought the team’s hard-nosed style of play to life. 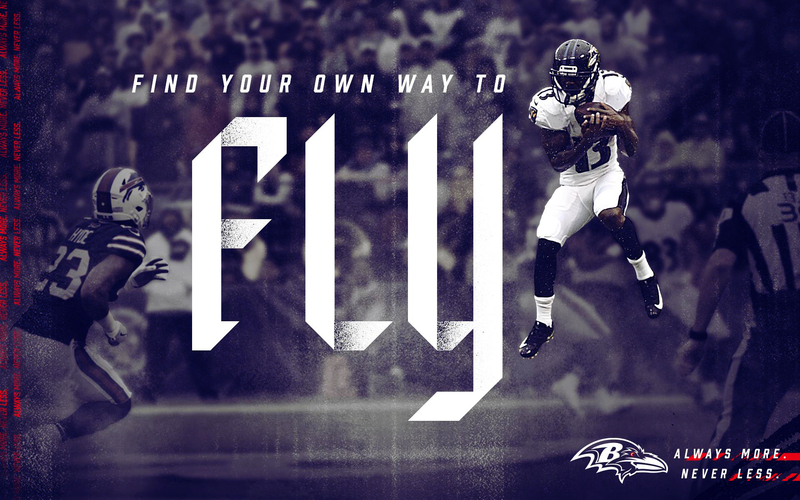 The team implemented the brand across social media channels, billboard placements, in-stadium signage, full page print ads in The Baltimore Sun, co-branded graphics with industry partners and game day print materials, setting the tone throughout the Raven’s 5-0 preseason. We launched the regular season with a three-chapter anthem that captured the team’s relentless pursuit of more and nodded to the literary tradition of the serial novel. Voiced by franchise legend Ed Reed, the chapters launched across the first weeks of the regular season culminating in a full-length anthem for the team’s week 4 rivalry game against the Pittsburgh Steelers. The anthem highlights the unshakeable bond between the team and the city that built it, as the attitude and iconography of Baltimore collide with the unyielding persistence of its players. And with eyes turned skyward, we showed a team prepared to give everything. Because the flock expects nothing less. Previous : Can University Brands Be Luxury Brands?